Whether this is your first time in the Algarve or the latest of many visits to the region we are sure that there will be something new and beautiful for you to discover. Old Village is a beautiful, tranquil and family-oriented resort in Vilamoura, one of the most popular destinations on the Algarve. We offer a wide range of apartment sizes as well as townhouses including studios, one bedroom, two bedroom, three, four and five bedroom properties, which can sleep up to 10 poeple. Most apartments on the original part of Old Village have either roof terraces or ground floor patios, which overlook the beautiful pathways and gardens within the complex. It is a quiet resort with warm temperatures all year round. The international marina is only a 10 minute walk away and the airport only a 25 minute drive. 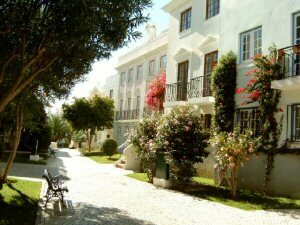 The magnificent architectural style of the Old Village is based on the classic 17th and 18th century town houses of Lisbon and Faro. Surrounded by the fairways of the beautiful "Pinhal" Golf Course and its own picturesque gardens and walkways, the resort is ideally located only minutes from all Vilamoura's facilities. The Old Village amenities include a supermarket, restaurant and bars, swimming pools and a childrens play area, all set in beautifully maintained gardens. The layout of the Old Village has been built with safety in mind, the whole resort being pedestrianised and with a 24-hour security service for additional peace of mind. But don't worry there are ample parking areas surrounding the Old Village, with direct walkways to the apartments. All of the apartments enjoy satellite TV with English channels, such as BBC and ITV. There is an internet point on the complex. Playing golf in Vilamoura may turn into a passion of a life-time. In Vilamoura, it is hard to choose. The five golf courses are all unique and appealing to players of all handicap levels. Arnold Palmer, one of the world's most illustrious golfers, designed the routing plan for this exciting new course, destined to become one of the most spectacular on European soil. The course features a couple of mounds amidst an otherwise flat terrain. This mimmicks the outline of the inland hills, which gives the course a sense of unity and harmony. The Victoria course measures 6,506 metres from the back tees, making it the longest in Portugal. Each hole, however, has a set of five tees to make it suitable for all handicap levels. The Old Course is one of the best known international golf courses and was designed and opened in 1969 by Frank Pennink. It is especially regarded for the way that the layout of the course follows the original contours of the terrain. It has recently undergone a lot of modernisation and upgrading, which adds to the level of excellence. Each hole is really memorable, having its own individual character. Players can build up their confidence over the first 5 holes, which are fairly straight forward. However, players will need to concentrate and be precise for holes 6, 7 and 8, which are more demanding. And then the well defended par-4 ninth has be negotiated for a decent score. To avoid bunkers and trees requires all of the golfing and strategic ability of the players. And the real test on holes 10, 11 and 12 is to achieve real accuracy and length off the tee. The next three holes offer some relief before players have to face the 16th hole, which is the last really challenging hole and the best par-5. Finally a chance to score well with the last 2 holes, which means that golfers can return home with a pleasant memory of their time on the course. Please ring for information on golf/accommodation deals. We can arrange transfers from the airport on request. Please let us know if you would like us to arrange this service when you book the apartment. The driver will meet you at the airport with a card with your name on it. It may also be possible for him to bring the keys to your apartment along. Please ensure you provide us with your flight details (flight number, arrival time in Faro and departure airport in the UK). Fares are approximately 30 euros for a taxi for up to 4 people with 2 suitcases and 45 euros for a minibus for up to 8 people with 8 suitcases (paid in euros direct to driver).